Mortgage Market Guide: 2016 GDP Disappoints. Inflation Still Tame. Last Week in Review: 2016 Gross Domestic Product was anemic. Inflation remained tame in February. Forecast for the Week: We’ll find out the scoop on monthly job growth in March. View: Boost your brainpower on a five-minute break. “Darling, you’re stronger than me.” Patsy Cline. 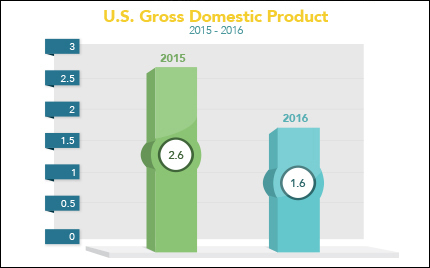 While 2016 Gross Domestic Product was anemic, consumers showed some strong spending in the fourth quarter. Final fourth quarter 2016 Gross Domestic Product (GDP) rose to 2.1 percent from the second reading of 1.9 percent. This follows a 3.5 percent increase in the third quarter. For all of 2016, GDP rose an anemic 1.6 percent, the worst since 2011 and below the 2.6 percent in 2015. There were some bright spots with the latest numbers. Consumer spending, which makes up two-thirds of economic activity, rose 3.5 percent from the previous reading of 3 percent. Corporate profits also were up 9.3 percent year over year, the most in four years due in part to a recovery in the energy sector. In economic news, Consumer Confidence was also a bright spot, as it surged well above expectations. However, tight housing inventory remains a reality across much of the country, and is a key factor in rising home prices. The January S&P/Case-Shiller 20-city Home Price Index showed home prices rose 5.7 percent year over year, just above the 5.6 percent expected. Inflation had a slight uptick in February from January but remained just below the Fed‘s target range of 2 percent. Core Personal Consumption Expenditures, which strips out volatile food and energy prices, rose 1.8 percent year over year in February, consistent with January’s reading. The Fed would like Core PCE to reach, exceed and stay above 2 percent — something it has not done in nine years — before hiking the benchmark Fed Funds Rate more aggressively. If Core PCE stalls at current levels, it will be tough for the Fed to justify additional hikes, as these hikes are designed to stave off inflation. Inflation is an important measure to watch because rising inflation reduces the value of fixed investments like Bonds. Since home loan rates are tied to Mortgage Bonds, home loan rates can improve when Mortgage Bond prices improve. The opposite is also true. The good news is that Mortgage Bond prices have gained some ground recently, and home loan rates remain historically attractive for those in the market to buy a home. March may log another solid month of job growth to wrap up the first quarter of 2017. National manufacturing numbers in the ISM Index will be released on Monday followed by the ISM Services Index on Wednesday. Also on Wednesday, FOMC minutes from the March Federal Open Market Committee meeting will be released. Labor market data will come from Wednesday’s ADP National Employment Report, Thursday’s weekly Initial Jobless Claims, and Friday’s closely watched monthly Jobs Report for March, which includes Non-farm Payrolls, the Unemployment Rate and Average Hourly Earnings. As you can see in the chart below, Mortgage Bonds have gained some ground after falling during the early part of March. While Bond prices have currently stalled, home loan rates remain attractive. Read an article. Successful people always have reading at the ready. Collect articles of interest in print collateral or with apps like Evernote or Pocket that can save and organize your stuff for later viewing. Grab a puzzle. Crosswords, Sudoku and even your old Rubik’s Cube are excellent ways to maintain cognitive function and also help you relax by focusing your attention away from the stress of the day. Make a smart snack. As small as the brain is, it takes a lot of energy to function. If sugar and caffeine are keeping you going — and keeping you up at night — try a midday energy boost from healthier snack alternatives like veggies and hummus or trail mix. Up next week: What to do when you have 10 minutes on your hands. Stay tuned!